I’ve posted a new video on my YouTube channel! Such a lovely day called for an outdoor video! Theres a little cameo by Max, my dog, too! In other news, here are a few of my favourite photos from my shoot last week! Well, I had to write about this! 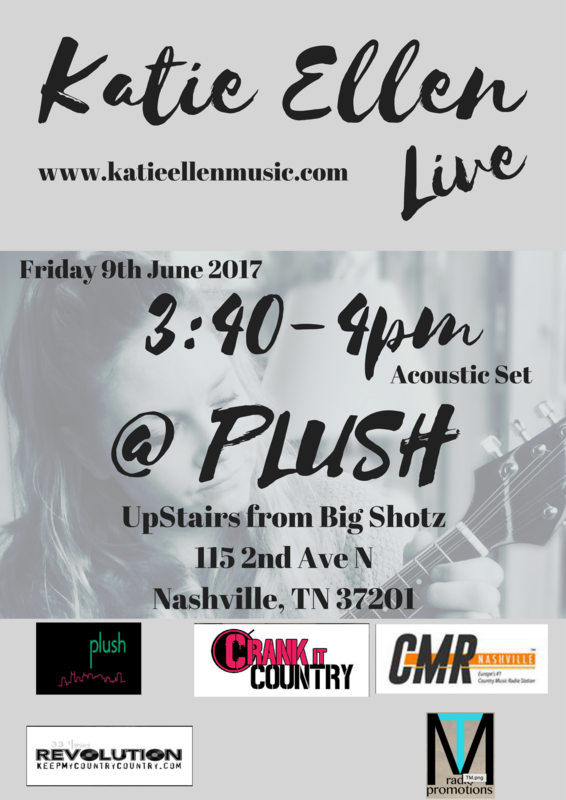 This morning I asked Lee Williams (CEO of BCMA) if performing on the Plush stage in Nashville was an ‘option’ for me. See, I knew they were looking for acts for a while but that voice in my head said, it will never happen! Now at 11pm on the same day, I’m searching for flights! I’m going to perform in NASHVILLE BABY! For as long as I can remember, I have dreamed of performing in Nashville. It’s even something I spoke about whilst I was training in LIPA (Liverpool Institute for Performing Arts). My voice coach, Christina, can vouch for that! I always thought it would a dream, something to wish for on birthday candles, you catch my drift! Now, I’m actually going! I’m travelling alone which is something I’ve always wanted to do and I’m currently looking for a place to stay and a few more performance opportunities, open mics, gigs etc. I’ll be blogging extensively throughout the next few weeks as I prepare for my journey to Nashville. This still feels so surreal, I might wake up any second and find out it’s just a dream, until then I’m enjoying every second! Well, yet again this wonderful world of music has pushed me out of my comfort zone and I’ve shot my first promo photos tonight with Fat Badger Photography. I was so nervous all day! But in the end David, the photographer, was super friendly and put me at ease. 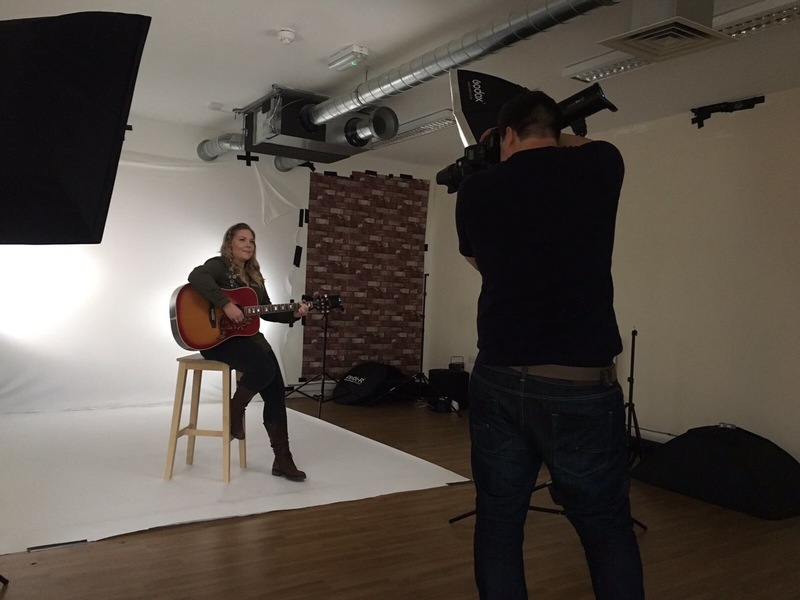 We started in the studio at Burscough Wharf and had a great shoot with my guitar and, of course, the mandolin made an appearance. All very Country, exactly what I envisioned. My friend and cheerleader Sara (twitter: @lostinmuzic) was there documenting for me and caught some amazing behind the scenes photos! Next, we ventured out on to the Canal. 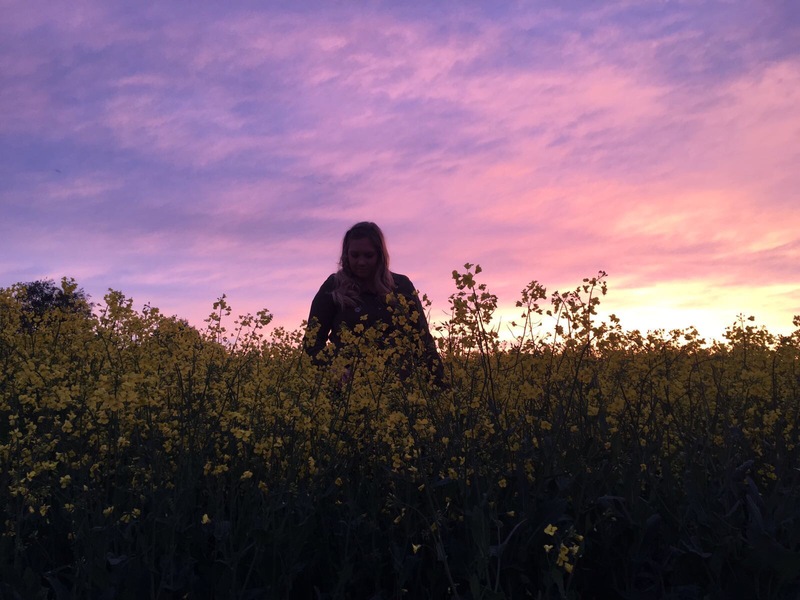 The suns then showed it’s face so we headed out to some fields for some sunset shots. My favourite part of the evening! Again, Sara caught some amazing photos on her iPhone which makes me super excited to see the professional pictures! Thanks for reading! I can’t wait to show you the edited photos! Last night I did an “In Session” on Beaten Track Radio (www.beatentrackradio.com) and it was a great experience! Here I am looking professional because you know… headphones! 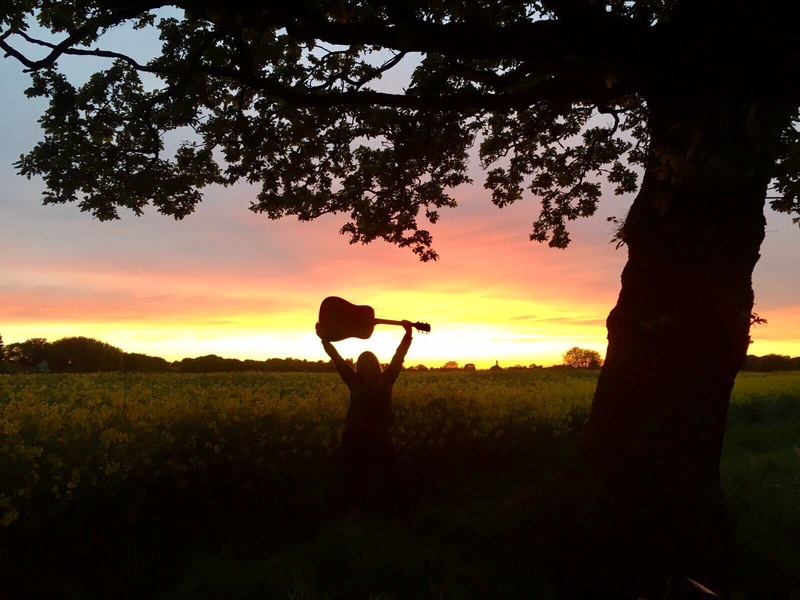 Thanks very much to Nigel at Beaten Track Radio for having me, and if you are a musician looking for exposure, he us looking for other musicians to continue the ‘In Session’ shows. You can broadcast from the comfort of your own home so you can live anywhere in the world! It’s a great way to gain new listeners and show people your music! I’ve whittled it down to these two songs… I think! These are obviously rough demos or live jams. This EP will end up a double disk album if I’m not careful! Even though I’d love to do that, it’s just not possible at the moment! 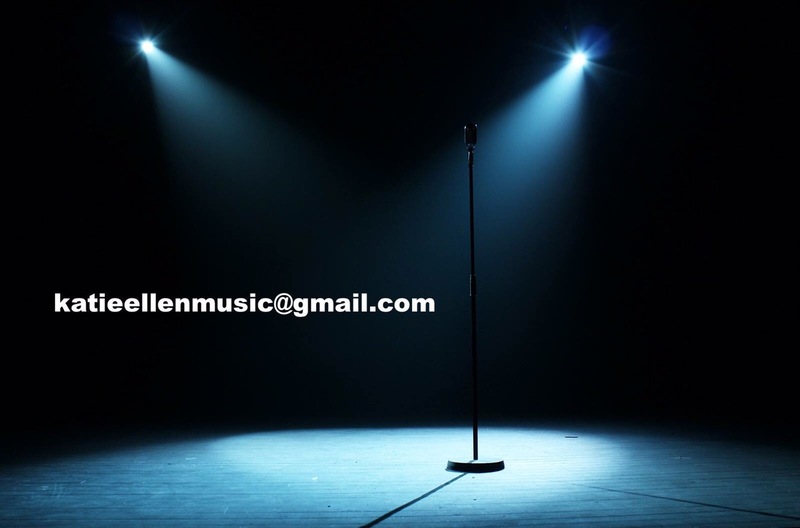 If you’re looking for performers, get in touch! Thanks for reading and remember, all suggestions are more than welcome! 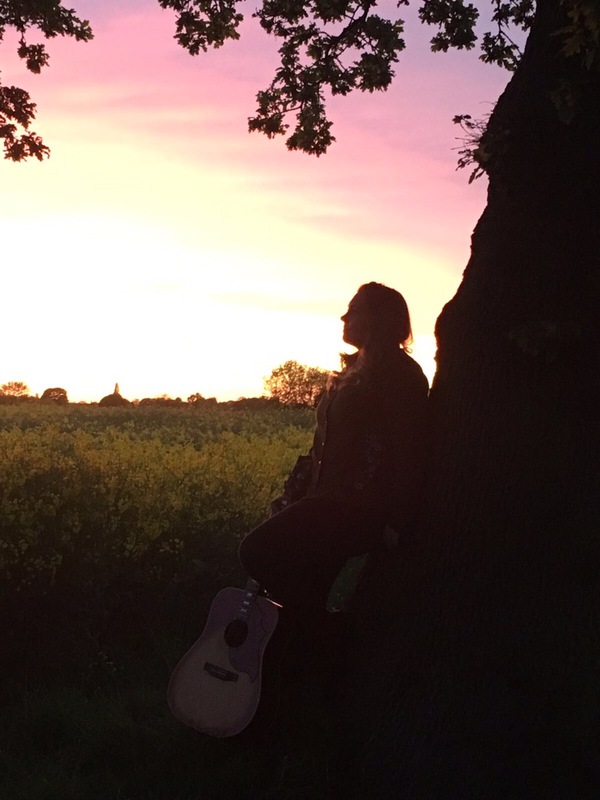 Thanks to BringCountry2UK for this feature! 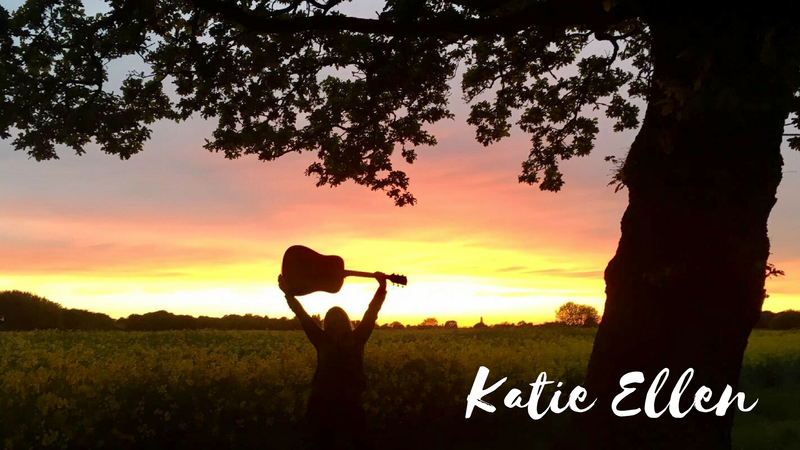 BringCountry2UK would like to tell you about Katie Ellen, a wonderful singer/ songwriter who sings Country/ Folk. I’m having a little moment of reflection while I write this in the sunshine at 0830 before I head off to teach! B&W pictures hide a multitude of hay fever related sins! Well, it’s been a very hectic few days! My single released on 01/05/2017 and I couldn’t be happier with the response! I woke up at 0630 (yes AM, not like me at all!) because it felt like Christmas morning for me! My song was out there in the big, scary wide world for people to actually buy and keep forever. I’ve spoken to a few creative people and it’s a common fear amongst writers, creative etc. It’s like giving a piece of your soul and asking people to judge it. What? Who in their right mind would ever do that, right? The answer is us! And be thankful we do! If people wrote songs and book, painted, drew, danced, acted just for themselves, our lives would lack excitement and colour! Anyway, I digress! The past few weeks I have dedicated to marketing and spreading the word about the single on social media. I’ve sent the mp3 to at least 100 radio stations with good response! Then I thought about doing something a little more scary. An online gig. A couple of weeks ago I saw Liz Longley (check her out if you want to hear some amazing songwriting) on Concert Window and thought it was a great idea! So, on 30th April, thats what I did. I streamed it on Facebook Live too. I have to say, it was probably one of the most terrifying things I’ve ever done. To the point, I thought I was going to throw up 5 mins before I went live! The set up was simple enough but with our relatively small 2 bed dorms house, its tricky to make it look anything like the corner of a living room! I think it worked well in the end with a number of people tuning in on Concert Window and Facebook. The highlight of the whole thing was someone “tipping” me $5 on CW. I haven’t stopped going on about it (sorry, to my other half ha!). Its the small things that make you feel appreciated! So the next one is in the pipeline and I will post as soon as I know the date. The future looks bright now, with exciting opportunities coming my way with some highly respected industry professionals. The single is now available through iTunes, Spotify, Google play, Amazon, Deezer and other music sites! The iTunes link is below! The video of the online gig is also attached, give it a watch and let me know on a scale of one to ten how nervous I look haha! 11 is a viable option! Thanks, as always, for taking the time to read about my journey to musical self confidence!